About 3,000 Chilean people died because of Pinochet's rule and many other people were tortured. 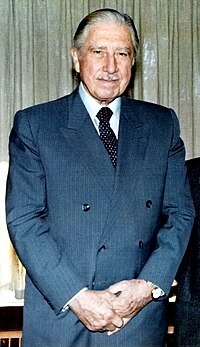 Many of the people that died during Pinochet's rule were communists, however, some of Pinochet's supporters died as well. The first days of his rule saw the most deaths, and in the weeks after the coup, Allende supporters were arrested and locked in a football stadium in Santiago. Most were released a few months later. Pinochet introduced many neoliberal free market policies, bringing growth and great economic progress to Chile. He was influenced by the ideas of Milton Friedman. In 1980, a plebiscite was held and Pinochet was kept in power. ↑ Chomsky, Noam (2006). Failed States: The Abuse of Power and the Assault on Democracy. Metropolitan Books. p. 111. ISBN 0-8050-7912-2. Meanwhile, Washington firmly supported Pinochet's regime of violence and terror and had no slight role in its initial triumph. This page was last changed on 15 December 2018, at 18:27.